Britannia, the protector of our isles, has been an enduring symbol of British pride and history, most recently featuring on our 50p piece - however with changeover in our coinage in 2008, Britannia isset to rule no more. She has been gracing our coinage for more than 300 years, since the end of the 12th century and the reign of Charles II. The predecimal 'one penny' coin shows a seated Britanniaholding Neptune's trident and shield, a design, which was retained over the centuries on the one penny coin until the advent of decimalisation in 1971. With the changeover to the new decimal system nearly 40 years ago, the "old penny" affectionately referred to as "d", disappeared from our wallets forever. Now immortalised in a limited edition, this numismatic wonder features one of the last one-penny coins in existence before decimalisation. 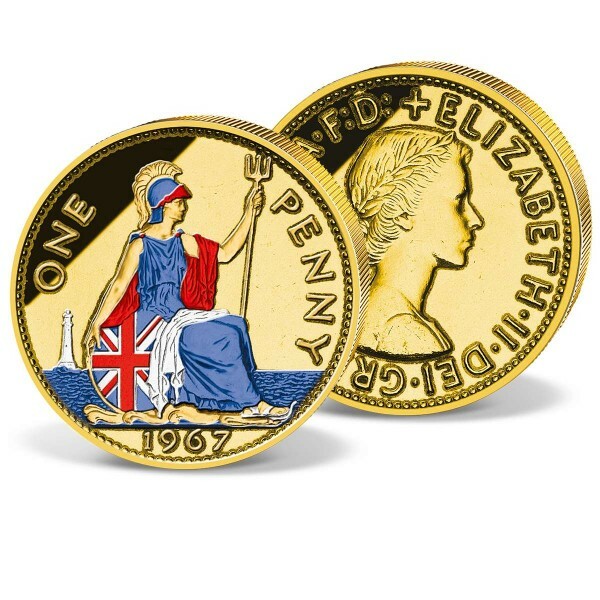 Minted between 1954-1970 an original old penny bearing the youthful portrait of Queen Elizabeth II has been beautifully plated in 24-carat gold. The reverse shows Britannia beautifully accented in glorious colour.